Very rare and early example of the handsome "Non-Pariel" STYLE model table. 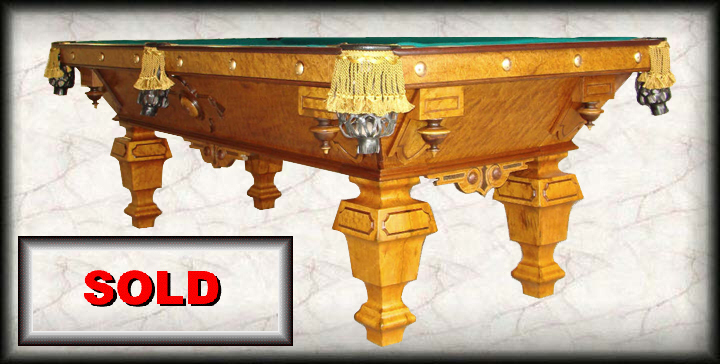 Factory converted from a 10 ft. pocketless table to an 8 ft. pocket model by Brunswick in likely the late 1800s, we've just finished completely refurbishing it to play good pool but without removing every last trace of it's remarkable 140 years of ageing. The table's stunning veneer is highly figural birdeseye maple, the accenting wood is walnut, and the gorgeous new railtops are genuine Brazilinan rosewood, with antique ivory diamond sights, just as they're supposed to be. Price: $16,500, plus delivery. Included are new balls, 4 new cues, and a triangle.